Have you ever turned around and realized that your child is not there? Even if it's just a couple of minutes before you are reunited, the anguish is intense. This has happened to me at a Mardi Gras Parade with my middle son, thank goodness it was only for about 5 minutes but those minutes seemed like hours. It's not easy keeping tab on your kids in a crowded public area and sometimes kids wander away like my son did.This always has me worried since my youngest is just shy of 3 and does not know phone numbers yet. I had the opportunity to review Original Safety Tats, as well as Quick Stick Write-ons. 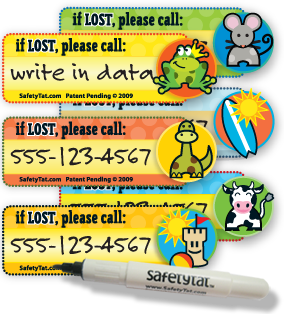 The Original Safety Tats are customized with your mobile number. It’s a traditional child tattoo, that you apply with water. The tattoo can last up to three days. WOW! The Quick Stick Write on’s are an applique style peel-and-stick “tattoo”. It is made of a micro-thin elastomer with medical grade adhesive that is hypoallergenic and skin safe. With these Quick Stick Write-ons you have the versatility of writing whatever information you need on the tattoo with a supplied pen. The pen is compact, the ink is water proof and the whole system is easy to use. This system requires no water for application and you can peel the tattoo off when you are done. Since the Original Safety Tats have my mobile number printed on them I use these when my toddler is going somewhere with me. But the Quick Sticks let me write my husband’s , mother in law's or my mom's number on them if they are taking the kids somewhere. Prices range from $7 to $19.95. They also have tats for other id necessities such as diabetic, non-verbal, autistic and allergies. Sample pack of Quick Stick Write-On! Winners choice of Boy, Girl, or Multi pack. we just got season passes to 6 flags...these would be great for a day at the park! I'd use them when we're out shopping. Leave a comment telling us when you would use Safety Tats. I will be using a random number generator to select the winner. Contest ends at 11:59pm CST on 12/15/09. If the prize is not claimed in 48 hours a new winner will be chosen. Contest open to U.S. residents only.The winner will be announced in this post(and emailed). At theme parks. It's so easy to lose kids at theme parks! I would use these tats on my 14 month old daughter. She loves to walk on her own like a big girl, but sometimes she wanders a bit off track. I would be a mess if i lost her, even for just 1 minute. These tats are a great invention!! When we go to Disney, these would rock. Love Safetytats, my kiddo still has hers on from our trip to Disney last week :) Great for the zoo too!